As Whiskeytown is about 4 hours away from the Bay Area we decided to drive up on Friday afternoon and camp at the lake ready for the 9 AM race start. We had 4 of us in the truck, the whole team, Andy Tubbs, Mari Chandler, Mark Manning and super supporter Hailey. This meant that we had camping gear for 4 as well as 3 bikes, a triple kayak and a mountain of food and drink to sustain us during the race and keep the crew happy. I have no idea how it all fit in the Xterra but it did with some room to spare. We found a great camping spot about a mile from the start, had a small fire going in about 10 minutes so the team could relax while eating the burritos we had picked up on the way. Another racer, Michael Miller arrived around 8PM and joined us by the fire looking for safety in numbers, as he had seen a couple of bears in the road less than a mile away. Mike would be volunteering this weekend as he had broken his kneecap into 5 pieces on a fall a few months before and was not ready to be running on it just yet. Michael spent some time trying to tease training secrets out of Andy and Mari but neither of them were giving much away. You know what these ProÕs are like. ÒYeah, we just go running when we feel like itÓ. Which translates to, Òwe run all day every dayÓ. When we woke up in the morning it was freezing cold and Mike had already left for the start. We quickly loaded the truck and made our way to the start to register and get breakfast. Loads of teams were getting their gear ready and staging their boats for the kayak section. As always this was a great time to catch up with friends and see who was racing the last event of the Norcal-AR series. We had high hopes for a good finish as weÕd already won the 2 previous editions. When we looked at the maps our worst fears were realized. 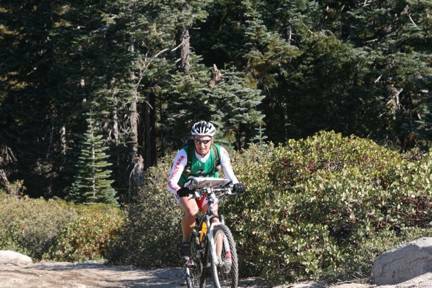 CP 1 was at the very top of the 6209Õ Shasta Bally Mountain, followed by 42 other CPÕs placed all over the map. This course was going to be long and epic. We were already cold at the start and it was going to get much colder for us and everyone else before the race was over. We all lined up at the start to listen to the pre race briefing and get the details on the course. 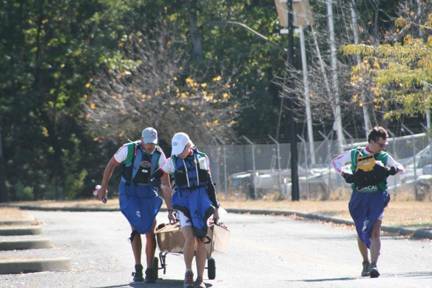 We were told that there would be a 10 minute time bonus for the first team to reach CP 1. Mari immediately turned to me and told me that I had to take things easy for the first few miles to give her a chance to warm up. She said it was a long race and we needed to ease into it. I told her of course IÕd take it easy. 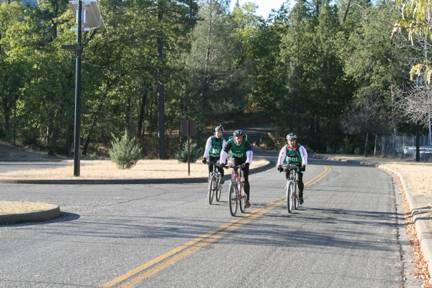 The race started and we rode as a group to the main road on the way to Shasta Bally Road, which would take us straight up 5000Õ of the dirt road. 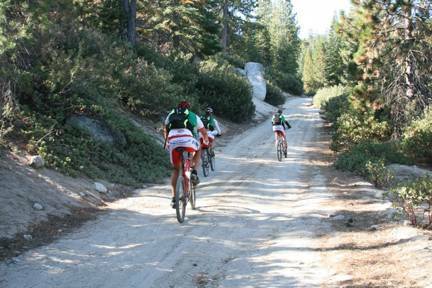 We were at the front of the pack just rolling along as we made the turn onto the dirt road. This is where we started to pull away from the main group. We were riding with a 2 man team called Barry Fast. Roy on this team had recently beaten Mari for 3rd place at Primal Quest Montana so Mari wasnÕt about to let them beat her at this event. The five of us were riding together and putting a big gap on the rest of the field while Mari and Roy chatted and caught up on the latest team news. After a couple of miles the talking stopped and we got into race mode. Andy was dropping back a little while Barry Fast surged a little on some of the steeper sections. I knew Andy could handle the pace and would dig deep to stay with the group so I started to up the pace on them a little at a time. I could tell from his riding style that Roy from Barry Fast was starting to suffer a little as the pace increased. Mari and I kept riding at the front and I kept upping the pace just a little bit more and pushed it over the brow of some of the steep little grades. We came to a very steep section that Mari and I were able to ride but Andy hopped off his bike and started to push it up hill. At that time both Roy and his teammate hopped off their bikes and started to walk as well. Now Andy was in his element and back on his feet, he upped the pace on foot dropping Barry Fast. At the top of the grade he was back on his bike and we were all riding together again. This was just the push we needed to drop Barry Fast and continue on to the top in the lead. About half way up the climb we were mobbed by a bunch of motorcycles having a blast riding on the dirt. Shortly after, I looked back and saw my truck coming up the hill with super supporter Hailey at the wheel and our camping buddy Mike in the passenger seat. Hailey was cheering, yelling and taking pictures while off-roading up the mountain. Some of the sections of the climb were so steep we all had to walk but we always kept things moving forward. As we reached the top of the mountain I was surprised at the number of people who were up there to support us. We were the first to arrive and get CP 1 so we had an immediate 10 minute bonus. We quickly grabbed our jackets from our packs ready for the descent, as it was really cold at this elevation with the wind blowing. After a quick bite to eat we set off down the hill just as Barry Fast were reaching the top with Scott Porter a few minutes behind them. We had a long descent with many sections that we couldnÕt ride as the rocks and drops were just too difficult. After we reached the Coggins Park area we were on a fantastic fire road descent that would take us on a really cool downhill roller coaster ride all the way to the trailhead at Crystal Creek and CP 2. About half way down we were doing well when I looked back and out of the corner of my eye I saw Andy going over his handlebars. He had hit a rock on some sand and lost it. He got up and said he was fine but we would later find out that this crash would have a big impact. We arrived at the trailhead and the parking lot where CP 2 was supposed to be but there was nothing there. We were asking people if they had seen a orange flag and widening our search looking for the CP flag but it just wasnÕt there. After looking around for somewhere between 5 and 10 minutes a car drove up with a bike on the back. The driver was holding the flag out of the window for us. Apparently the flag had been in the wrong parking lot about half a mile back down the road. We punched the passport and jumped onto the single track in an attempt to make up the lost time. The volunteer had promised us that we would get a time credit but that was no reason to slow down and let Barry Fast catch us again. We found CP 3 without much trouble and were on the downhill to CP 4 when we went through a riverbed and a few hundred yards later Mari called out saying she had a flat tire. We all worked together to change the flat and just as we were getting the tire back on Barry Fast came by us. The chase was on again and I put Andy on the towline as we chased them back to the TA. After a mile or two I could see them a hundred yards ahead and we were closing the gap. We came around a corner and found them stopped in the trail looking at the map. We flew past and came into TA 1 two minutes ahead. 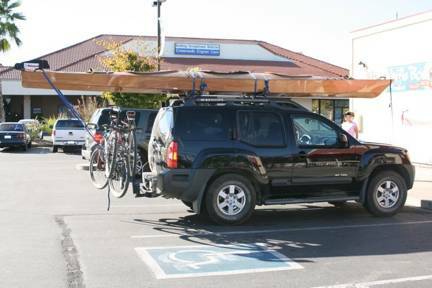 We picked up the boat and grabbed some food while we ran to the water ready for the 18+ mile paddle on Whiskeytown Lake. Andy was really struggling at this point. The crash had injured his hip and back, he couldnÕt even bend down and pick up his paddle or lace up his shoes. We managed to squeeze him into the boat but it looked painful. As always, Andy was putting on a brave face. We were paddling into the wind on our way to CP 6 and I was hoping that the wind would pick up a little more for the paddle back so as we could put up our new WindPaddle sail. We were not so lucky, the wind was dying down as the afternoon went by but we were all getting very cold as there was enough of a breeze to create a serious wind chill with our wet clothes. It took us a few minutes to find CP 7 as we ran up to the road and dropped into the trail from above but we were soon on our way back across the lake for CP 8. We arrived at the location for CP 8 but it wasnÕt where it was supposed to be. We continued paddling along the shore hoping it was just in the wrong spot and not stolen but we reached the dam still without seeing the flag. I even measured the distance back from the dam with the Speedcoach kayak computer but still couldnÕt see the flag. We moved in closer to the shore and paddled slowly in case we had just missed it. After a few minutes I spotted a corner of the flag sticking up from the sand behind some rocks. It had come untied in the wind overnight and fallen down. It was impossible to spot from the initial approach. Mari jumped out of the boat, punched the passport and retied the flag to the tree it was supposed to be on. We had lost another 5 to 10 minutes messing around with this CP and could see Barry Fast in the distance as we paddled away. They wouldnÕt have any trouble finding it now that it was back in the tree. We arrived back at the TA freezing cold and wet but ready for the long night ahead. The organizers had hot soup and coffee waiting for everyone as well as baked potatoes. It was now just after 6 PM and the sun was starting to go down. Andy was still having trouble as we were getting on the bikes. He still couldnÕt bend down and was visibly hurting. We had loaded up our packs with hiking shoes, warm clothes and loads of food and they were bulging under the strain. We rode back out to the road and onto the dirt again. We passed a hunter with a loaded rifle hanging out on the fire road. Mari asked what she was hunting and she said deer and bear. She asked us if weÕd seen any bearsÉlike weÕd tell her if we had. I told her that a whole bunch of people would be riding through here, hoping she would give up shooting stuff and go home. We know where the Bears are!! 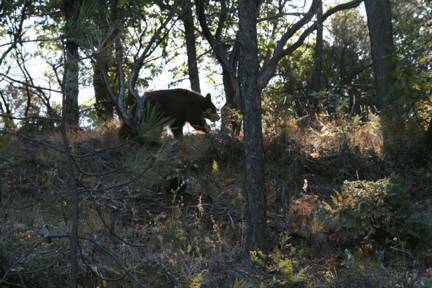 This is the mother of 2 that Hailey and Mike saw on Shasta Bally Road. CPÕs 10 and 11 involved a lot of climbing and we pushed our bikes for a while. Andy was in a lot of pain and dragging behind us. It was now completely dark and getting colder. At CP 11 we made a poor decision. We chose a trail that seemed to be going in the direction we need to go but after following it downhill in the dark for a while we hit the river. This was really bad. We werenÕt supposed to be any where near the river. I heard it before I saw it and knew we were really in the wrong spot. We looked around for a while trying to see if there was a way to get to were we needed to be without climbing back up 800Õ to CP 11 but there was no other way. The trail appeared to dead end right there and we were cliffed out with nowhere to go but back the way we came. We started pushing our bikes 800Õ back up the hill and this is where AndyÕs sprits began to drop. It was obvious that we would lose the lead by the time we got back on track. We had spent over an hour doing the drop down to the river and climbing back up. The next 2 CPÕs went fine and we arrived at TA 3 to find out that we were now almost 2 hours behind Barry Fast and Scott Porter. 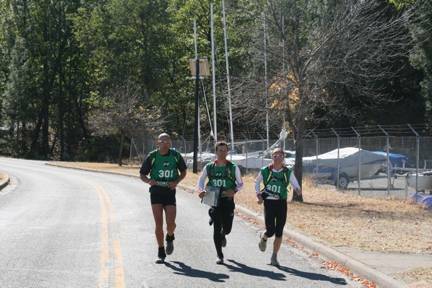 We made a quick transition to our running shoes and set out to chase down the leaders. We passed CP 15 when we saw Scott Porter coming up the hill towards us. He was on his way to CP 20 but he told us that Barry Fast had got lost on the way to CP 17 and he hadnÕt seen them for a while. Our spirits rose when we heard this. We thought that Scott was about an hour ahead of us and he would have more trouble keeping a fast pace on his own as the night dragged on. We might be able to catch him if we kept pushing each other through the night. We arrived at CP 17 to a warm welcome of clean bathrooms and a big cooler of soda. I threw down a couple of PepsiÕs and found out from the CP staff that Barry Fast hadnÕt arrived yet. They had lost 2 hours out there and we were now second on the road. After some cold sodas and good news our spirits were high and even Andy was feeling better. Just as we were leaving the CP we could see a couple of headlamps up on the ridge trying to bushwhack down to the CP. We turned our lights off and sneaked away into the dark of the road. We had a really cool section with a steep climb up a rope after CP 19 that took us back to the ridge and on our way to CP 20. Just after CP 21 Mari spotted something called a Ringtail Cat hiding in a tree next to the trail. These are apparently very rare and only come out at night. IÕd never even heard of one before but it was cool to see it. We had a little trouble finding the right trail that would take us down to CP 26 but only lost a couple of minutes before we were on the right path. This is where the Waterproof Pedometer came into its own. We arrived back at TA 4 to find we had pulled back 45 minutes on Scott but he had missed CP 24 thinking it was misplaced. 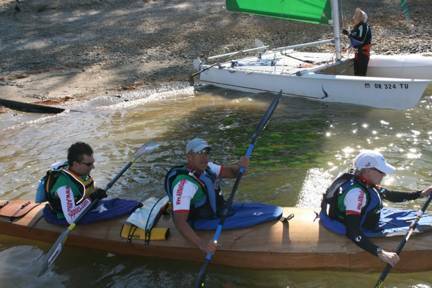 We had found it without any problems so he was now down 1 mandatory CP as well as one of the optional kayak CPÕs. We were 2nd team on the road but we were ahead of Scott in CP points, which put us in the lead overall. All we needed to do was stay on course and get all of the remaining CPÕs and we could still win. The next bike leg was the hardest part of the race for us. As we rode away from the TA wearing all the clothing we had with us, we had a downhill section on the road to the bridge. The wind chill was so bad that by the time we reached the river we were all shaking uncontrollably and our hands could hardly move to pull the brake levers. As we arrived at CP 29 we were all very tired from the earlier chase and it was that really dark time a couple of hours before dawn when everyone struggles to keep going. Everyone that is, except Mari, who was absolutely flying and pushing the pace on every climb and descent. 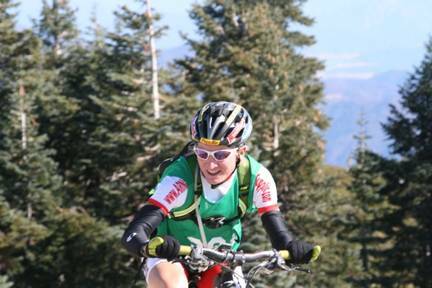 Both Andy and I couldnÕt believe how much power she still had after 20 hours of flat out racing. We found CP 30 at Brandy Creek Falls and saw Scott again on his way out of the loop. After a very nasty bike push on the way to CP 31 we hit the highly rated single track that we had been told about at the start of the race. They werenÕt kidding, it was a fantastic trail that was fast and smooth as it swooped down the side of the mountain. I was wishing I wasnÕt so tired as I would have really enjoyed it had I been more awake. When we arrived back at TA 5 it had just got light and we heard that Scott Porter had pulled out of the race and gone home. He had also missed CP 29 on the bike section and was now down two mandatory CPÕs and 25 points. We also found out that after getting badly lost on the trek section Barry Fast had pulled out with a cut sidewall on one of the bike tires. They were in a solid 2nd place and our nearest competition. We were told that the next closest team was a couple of hours behind us and a few had skipped the whole 3rd bike section and just rode back from the previous TA. After some warm food and more Pepsi all we had to do was get the final trek CPÕs and get back to the finish before 2PM. We had about 4 ½ hours to do around 5 miles on foot, which didnÕt seem too bad. I really enjoyed the next section as it was rogaine style and all the CPÕs were off trail requiring some serious bushwhacking to find. This was fun but Andy and I were dragging while Mari was still on top running form. She kept trying to make us run to the finish but we were resisting every attempt. We still had the lead and plenty of time in hand. After a lot of persuasion Mari coaxed us into running the last ½ mile down to the finish and Andy started coughing so bad we joked about having to drag him across the line by the straps on his backpack. We finished the race and race director Rich told us that we had won the event as the only team to get every CP and take maximum points. Everyone else had either skipped sections or missed optional CP points. Everyone was relived to have finished. 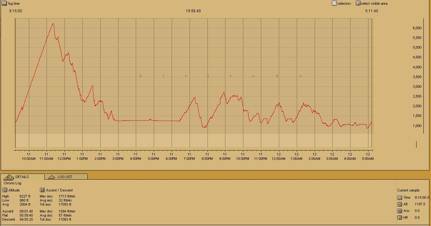 It had been a long race with a huge amount of climbing. We had taken 27 hours and 12 minutes to cover the whole course. My Suunto had switched off after 20 hours of racing with its memory full. Up to that point we had climbed over 17,000 feet with 7 hours of racing still to go. I wish I had the whole download as I have the feeling it would have been over 25,0000Õ of climbing in the 27 hours. 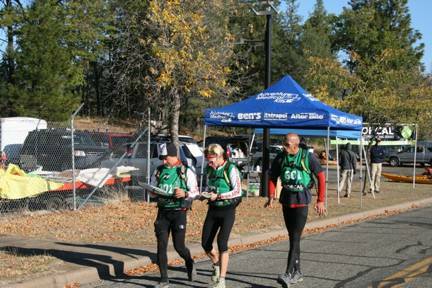 This was a fantastic event with epic terrain, scenery and competition. The organizers had done an excellent job in putting everything together including a wonderful post race meal with burritos and cake. For their first 24 hour course Tom Thomas and his family had set a very high bar for other events to follow. IÕm looking forward to more events from this team in 2009. As always Mari and Andy were perfect teammates and I hope we can all race together again in 2009 after such a successful season. 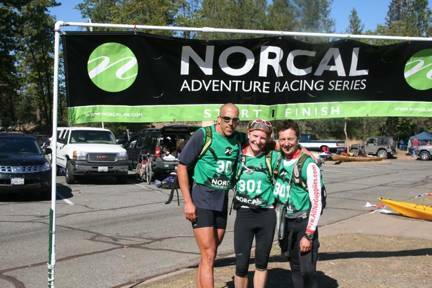 Thanks to Brunton, INOV-8, Ritchey, Magura, Ellsworth and BooCoo Gear for providing Team AR Nav Supplies with the best gear for Adventure Racing.